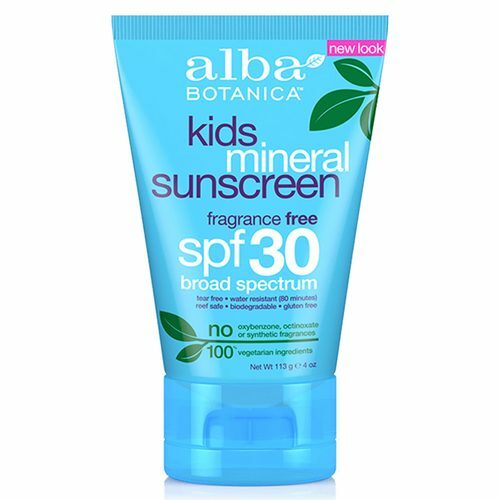 The natural Very Emollient Sunscreen from Alba Botanica is paraben free. 警告: For external use only. Do not use on damaged or broken skin. When using this product keep out of eyes. Rinse with water to remove. Stop use and ask a doctor if a skin rash occurs. Keep out of reach of children. If swallowed, get medical helps or contact a Poison Control Center right away. Ingredients: Aqua (water), Glycerin, VP/hexadecene Copolymer, Sodium Stearoyl Glutamate, Dimethicone, Aloe Barbadensis Leaf Juice(1), Calendula Officinalis Flower Extract91), Camellia Sinensis Leaf Extract91), Chamomilla Recutita (matricaria) Flower Extract(1), Olea Europaea (olive) Leaf Extract, Ginkgo Biloba Leaf Extract, Panax Ginseng Root Extrct, Citrus Aruantium Dulcis (orange) Peel Oil, Glycine Soja (soybean) Oil, Cetyl Alcohol, Citric Acid, Glyceryl Stearate SE, Potassium Cetyl Phosphate, Sodium Chloride, Tocopheryl Acetate, Xanthan Gum, Alcohol(1), Benzyl Alcohol, Phenoxyethanol, Potassium Sorbate, Sodium Benzoate, A-Terpinyl Acetate, Dimethylhydroxy Furanone, Nonanal, Vanillin, Limonene, Linalool (1)Certified Organic Ingredient. Hit or Miss? Sorry, it was a "MISS" for me. Although, I feel this product may work for someone else, it wasn't successful for me. Unfortunately, I suffered an allergic reaction to the aloe in the product. I also found the sunscreen to leave a "greasy" residue on the skin after application. Excellent! !, Great sunscreen!! My acne reduced after I started using this sunscreen! !